The 2014 FIFA World Cup begins Thursday, when host nation (and prohibitive favorite) Brazil kicks off against Croatia. The United States will send its 23 into the fray, too, and our relatively inexperienced side will be tested early, thrown into a group that features powerhouses Portugal and Germany, plus Ghana, the squad that bounced the U.S. from the last two Cups. And though the task at hand is daunting, the U.S. team is ready for the challenge. All this week, Rolling Stone will be profiling the soldiers of Sam’s Army, beginning with Chris Wondolowski, the cult hero known as “Wondo.” His road to the World Cup has been anything but traditional – he played at Division II Chico State, was chosen in the last round of Major League Soccer’s Supplemental Draft, and, for a time, made ends meet by working as a coach for a youth team – yet, thanks to his preternatural ability to put the ball in the net, Wondo beat the odds. He’s won MLS MVP honors, shined against international competition, and, last month, he earned a spot on the U.S. team, ahead of established stars like Landon Donovan. Here, he discusses his improbable rise, his goals for Brazil, and his deep affinity for pizza. Usually, I use music to get me ready and in the right mindset. I love walking the field, having my headphones on, envisioning the ball hitting the back of the net. I listen to Jay Z on Spotify, starting with Reasonable Doubt through The Blueprint and all the way to Magna Carta. You listen to Magna Carta? Even Jay doesn’t like that album all that much. I know; I like more of his older stuff to be honest, but I don’t mind Magna Carta though. I’ll listen to it. Are there any guys on the team who share your love of hip hop? Well, Clint Dempsey for sure. But there’s not, like, a ton of cyphers going on. We like to joke around, though. I think [Kyle] Beckerman can hold his own in a rap flow, and there’s a couple others that can do alright. Tim Howard can hold his own as a DJ. He’s got good taste in music. Your superstitions are pretty well documented, but how deep do they go? They go pretty deep. I definitely go through a routine, walking the field, and I definitely have to put my socks on a certain way, then shorts, then shirt. It always has to go all left first, then all right, then shorts, then top, in that order. Always. 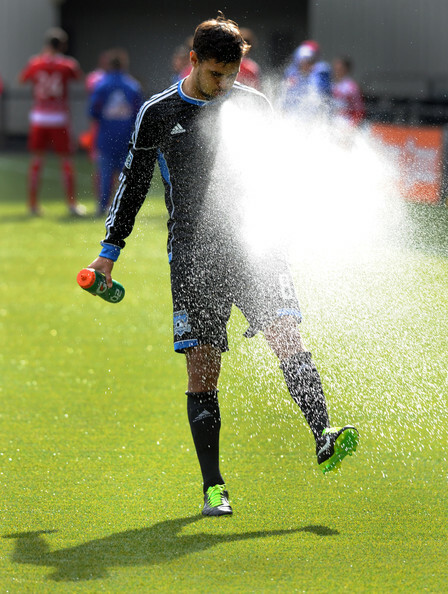 Before games, you do an epic water spray, too. Where’d that come from? [Laughs] To be honest, I’ve been doing that since high school; it’s just one of those things. I don’t know where it came from. I was a big fan of WWF, so maybe subconsciously it came from there? But it became habit, and whether it’s a reserve game, practice game, or a national game, I still do it. Much has been made of your selection to this team, in particular, the fact that you beat out Landon Donovan for a spot. Are you getting tired of answering questions about him? Um, yeah. A bit. Don’t get me wrong, I understand why, because he’s such an amazing player, he’s one of the best to ever have donned this jersey. But I’ve been able to play at a high level and I think that’s one of the reasons I made the 23, and I think the 23 here are ready to make a statement in Brazil. We feel very confident. First and foremost, we have to get three points against Ghana. It won’t be easy, but we’ve got a good game plan. It’s still unclear if you’ll be starting or coming off the bench during the World Cup; how do you see your role on the team? I think my role’s still being defined; if I’m not starting, I want to push the starters to make them better. I want to start, I want to get as many minutes as I can, but If I’m coming off the bench and we need a goal late, I’m going to be ready for it. If I do get an opportunity, I’m going to be ready to hit the back of the net. You never know when your chance is going to come, and you’ve got to embrace it. This is kind of a weird question, but, after you made the team, a local paper did a profile on you, and there’s a picture of you at a restaurant, in front of a “Wall of Fame.” Is your name on there? [Laughs] Well, I’m trying to stay anonymous, because you have to drink 100 beers to get on that wall. It’s at a place called Pete’s Brass Rail and Car Wash, and it’s kind of funny, because there’s no car wash, no brass rail, no Pete. Let’s just say I don’t want to be on that wall just yet. But I definitely could qualify. On a related note, since you’ve been training for the World Cup, is there one food you miss? I definitely have a sweet tooth, so if I get some ice cream, some chocolate chip, that’s a good thing. Also, pizza. Me and pizza get along very well. I’m pretty liberal with my pizza loyalties. I don’t mind a Chicago deep dish, but New York pizza, they do it right. I like the big pieces you’ve got to fold. The bigger the better. What’s one thing you’ll be bringing to Brazil? I’ll have my iPad with me … it’s nice to have it, so I can watch Game of Thrones. It’s been killing me not being able to keep up right away, having to wait for it to be streamed the next day. I just caught up with Mad Men, Modern Family too. Are spoilers a major concern for the USMNT? We have to be careful because we’re all in different spots, trying to catch up with it; I think we need to get an HBO GO account for the team. Like, you’ll be talking about it, and you’ll hear someone in the back going ‘No no no! Don’t tell me!’ Sometimes we like to mess with each other and make up things that are completely false. But we’re usually pretty good about not spoiling it.